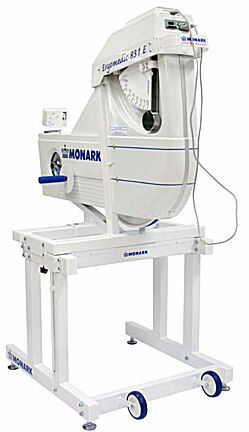 The Monark 831E Upper Body Computerized Ergometer has a stable arm ergometer that satisfies the requirements for fitness and endurance testing for the upper body. The Monark 831E Upper Body Computerized Ergometer is a secure and user friendly bike that provides a constant workload independent of pedal speed. It is easy to control by external devices such as PCs and ECG. Monark’s renowned pendulum system has been adapted for use in rehabilitation, sports medicine and medicine. Ideal for exercise from a wheel chair. Controlled digital by ECG or PC with RS232 cable. Rust protected and powder painted. Heart rate measured with telemetry or chestbelt. Optical metronome that shows rpm or pulse. Warning signal for MAX heart rate limit. CE approved according to Directive 93/42. Protocols for Åstrand, WHO and PWC. Custom protocols with templates for increment and ramp. Manual protocol with possibilities to save afterwards. Power measurements in different units (watt, kpm/min and vo2). Brake force measurement mode or continuously displayed in other mode (N, kp). Database to manage individuals and groups. Order your Monark 831E Upper Body Computerized Ergometer from FitnessZone.com today!